SAN JOSE, CA – Super Micro Computer, Inc. (NASDAQ: SMCI), a global leader in enterprise computing, storage, networking solutions and green computing technology, today announced the launch of its new enterprise class 8-socket server. Supermicro’s 7089P-TR4T supports eight Intel® Xeon® Scalable processors with three Intel Ultra Path Interconnects (UPIs) per CPU at 10.4 GT/s to deliver next-generation 8-socket server performance. Customers can unleash the ultimate potential of their high-performance computing (HPC) clusters or in-memory databases by installing up to 12TB of DDR4 memory, 41 NVMe devices (32 hot-swap), 23 PCI-E 3.0 cards, or eight double-width GPU cards. For virtualization, imagine the confidence customers will feel while running their Virtual Machines (VMs) on 224 Intel® Xeon® processor cores (448 threads), or as they scale to meet their rapidly growing compute requirements. For enterprise-class resiliency, the system comes standard with over 40 built-in advanced RAS features to deliver enterprise class reliability, availability and security. 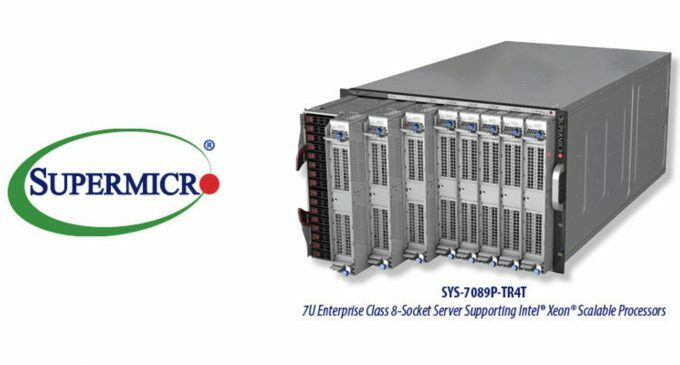 Supermicro offers the 7089P-TR4T as a complete system solution with an impressive range of global on-site service and support packages. The 7089P-TR4T extends Supermicro’s impressive multi-processor (MP) portfolio which also includes SuperServer 2049U-TR4, which is a four-socket Ultra server that supports four Intel Xeon Scalable processors, up to 6TB of memory, 24 hot-swap 2.5″ drives (up to 4 NVMe), 11 PCI-E 3.0 slots, and flexible networking options in a 2U form factor. SAP HANA certification for Supermicro’s MP portfolio is in development and expected in 2018. For updates on SAP certification, please see https://www.supermicro.com/solutions/sap/index.cfm. For more detailed information related to Supermicro’s new 8-socket system, please go to https://www.supermicro.com/products/system/7U/7089/SYS-7089P-TR4T.cfm.